Fighting continues. It rages out-of-control. Washington plans permanent occupation. Withdrawal is more fiction than fact. Thousands of US troops will remain. They’ll do so indefinitely. It’s just a question of how many. Obama ravaged Libya. Syria is his war. So is Iraq war III. Permanent war is official US policy. Obama is the latest in a long line of US warrior presidents. He’s a war criminal multiple times over. He’s waging war on humanity. He intends escalating things dangerously. 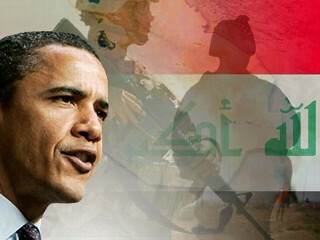 He promised no US ground forces in Iraq. He lied. Over 1,000 special forces were deployed. Hundreds more are coming. Brigades of US ground forces may follow. Mission creep often follows initial forays. Another potential quagmire looms. Joint Chiefs Chairman General Martin Dempsey said he’ll recommend deploying US combat troops if ISIS/ISIL/the Islamic State (IS) can’t be defeated other ways. In other words, Obama’s “no (US) boots on the ground” is another of his many Big Lies. If Dempsey and other military commanders recommend them, expect invasion followed by full-scale war. Expect potentially thousands of US troops deployed. Expect protracted fighting. The Pentagon’s 2006 Quadrennial Defense Review (QDR) called it the “long war.” It rages. It’s permanent. It’s against enemies America invents. America’s permanent war agenda wasn’t explained. Nor was using “peacekeepers” as imperial occupiers. Coalitions of the willing came later. Obama continues America’s longstanding tradition. Wars are glorified in the name of peace. The business of America is war. It’s a national addiction. It’s a longstanding obsession. Brute force is official policy. One nation after another is ravaged. They’re destroyed. They’re plundered. They’re transformed into dystopian wastelands. Their people are exploited. “And during that period, I spent most of my time being a high class muscle-man for Big Business, for Wall Street and for the Bankers. Today America’s global empire extends everywhere. Super-weapons Butler couldn’t have imagined enforce it. Modern-day Butlers don’t exist. Profiles in courage aren’t a US attribute. On issues of war and peace, both parties march in lockstep. So do MSM scoundrels, academia, think tanks and other influential organizations. They ignore rule of law principles. They’re on the wrong side of history. They’re mindless of potential catastrophic consequences. Their ideological extremism makes the unthinkable possible. Things today are dire and then some. Potential global war looms. Preventing it matters most. Not as long as Obama remains unchecked. Not while he pursues open-ended conflict. Not when permanent war remains official US policy. Not while one country after another is ravaged and destroyed. Not when warriors run America. Not in the absence of mass public outrage. Obama insists he’s authorized to wage open-ended Middle East war. He lied. No nation may intervene in the internal affairs of others. None may attack another except in self-defense. None may do so without Security Council authorization. None exits. Expect none forthcoming. It doesn’t matter. Obama intends making a bad situation worse. He threatens the entire region. World peace, security and stability hang by a thread. New World Order extremism threatens them. Ukraine is a global flashpoint. It’s the gravest geopolitical crisis since WW II. Sergey Lavrov accused US-led NATO of “pushing Kiev for a forcible solution” to ongoing conflict conditions. It’s what Washington deplores. It’s what it’s going all-out to prevent. It’s to assure unchallenged imperial control. It’s to eliminate Russia as a military and geopolitical rival. They know “blindly following Washington (rules turns sovereign) European powers” into vassal states. War is more than a racket. It’s ideologically extreme. It’s cold-blooded mass murder and destruction. It inflicts unconscionable suffering. It’s the highest form of lawlessness. It serves monied interests. It lets them use ill-gotten gains to make more of them. It makes the world safe for war-profiteers. It lets them gorge at the public trough. Nations are destroyed to save them. They’re pillaged for profit. Populations become disenfranchised. Workers become serfs. Local cultures become mass-market consumer ones. Dominance legitimizes capital’s divine right. Plunder assures obscene profits. Capital accumulation demands more. Profiteering and dominance matter most. Trillions of dollars are spent. Waste, fraud, abuse and the grandest of grand theft are standard practice. Homeland needs go begging. So do popular ones. Peace is a convenient illusion. Wars without end rage. No end in sight looms. America’s war on terror is state terror. There’s none able to suppress horrendous genocidal high crimes against peace. Why most Americans don’t challenge what harms them, they’ll have to explain. They have a choice. They can demand peace, equity and justice or potentially perish in a mushroom-shaped cloud. No in between appears likely.